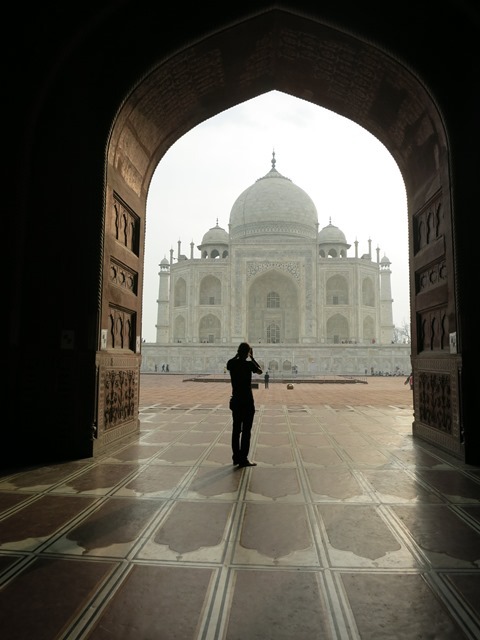 We’d woken up at sunrise to catch an early view of the Taj Mahal, which might have explained my lack of enthusiasm at visiting one of the world’s most admired buildings. Luckily the queue at the west gate was still quite short, and before long we were lined up in our gender-specific areas to be searched. 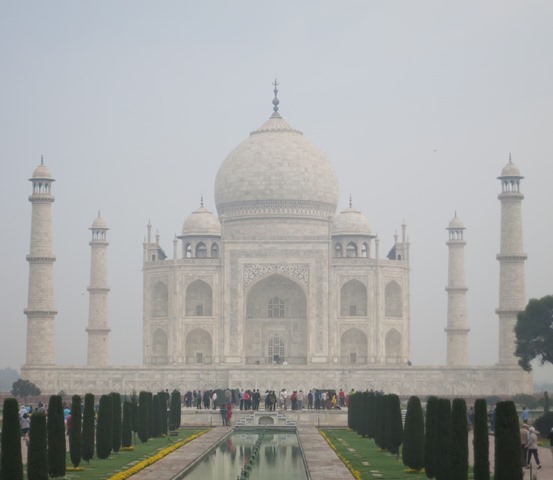 I was released a good deal before Maria, and as she was waiting for the women in front to empty the contents of their bag I looked to my right, where I could see the palace enveloped in a haze and gradually disappearing behind the growing crowd of tourists. 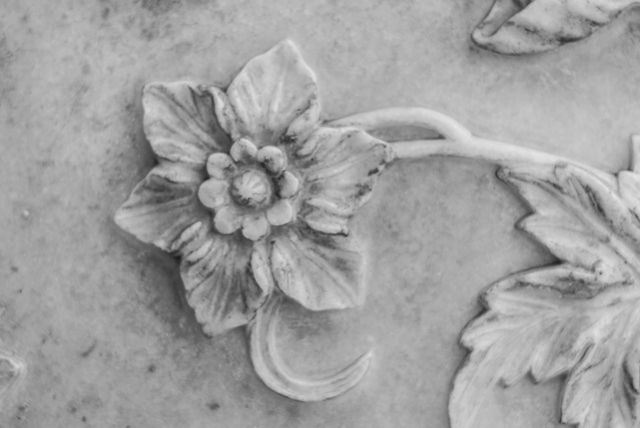 Rather than force my way through the first wave who’d gathered at the main gate to take ‘The’ picture, I busied myself around the edges; photographing details – looking for something unexpected. Eventually we squeezed through and I left it to Maria to quickly get ‘the picture’ while I started the walk along the manicured gardens. 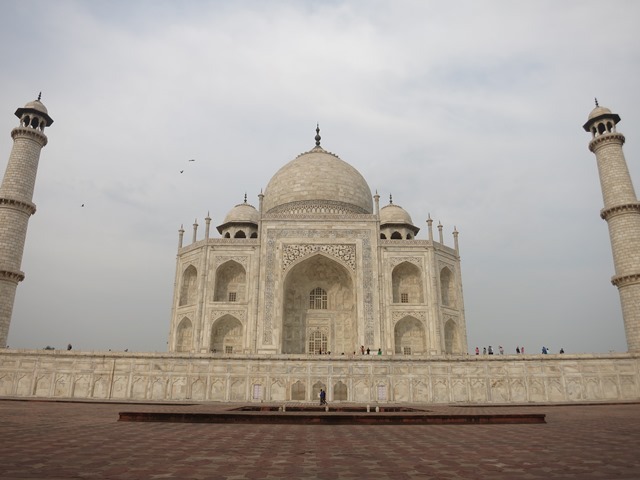 Whenever you visit a monument as famous as the Taj, it can be hard to form a personal connection with it. 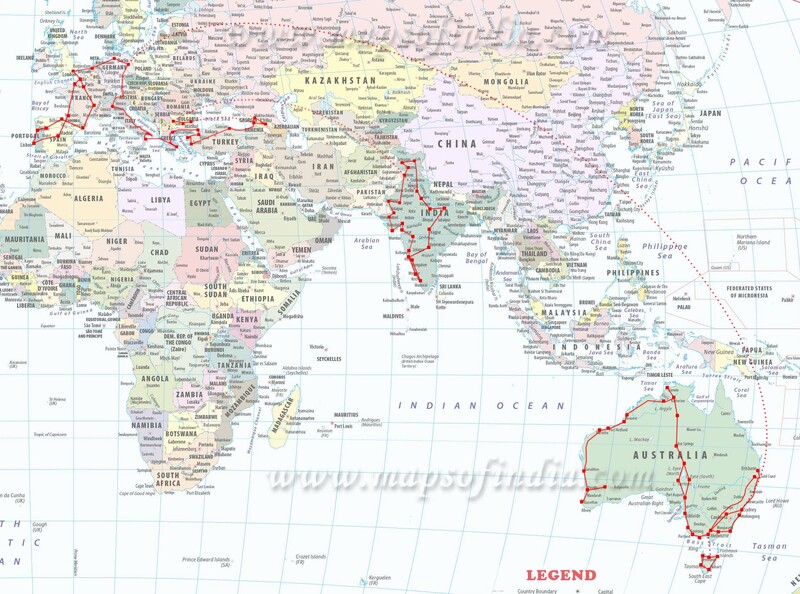 You’ve read about it in countless books and seen it on postcards and posters everywhere. Iconic, uncluttered by crowds, orange-tinged by a setting sun; how do you exchange that perception for something more meaningful, especially when you’re forced to deal with the grim reality of guards, barriers, inclement weather and other people? I marched in step with everyone else and tried to take in the full impact of the place. It was pretty, yes. 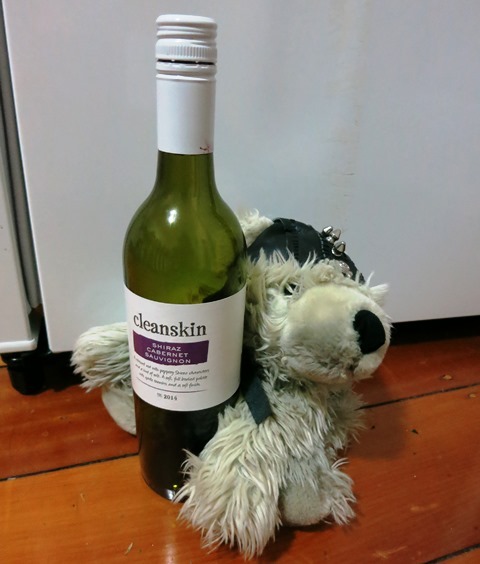 Well balanced and very nicely proportioned; sure, but what else? I wasn’t quite getting what made countless generations of writers and photographers swoon. We were given special shoe covers to wear before being permitted to climb the steps to the base of the mausoleum, and from there I carried on perusing the details. 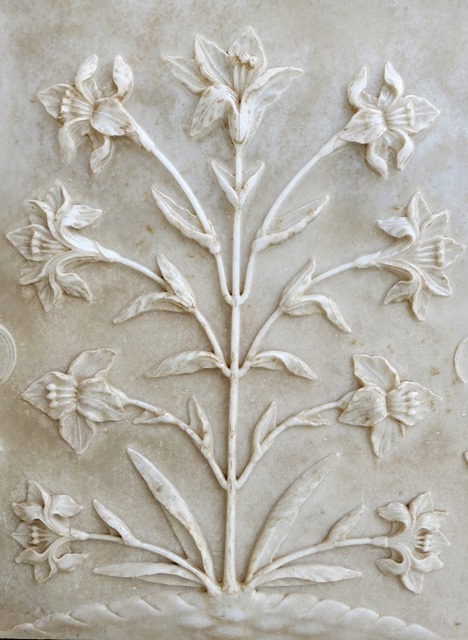 The carved marble floral motifs – worn smooth by millions of hands – are beautifully executed. 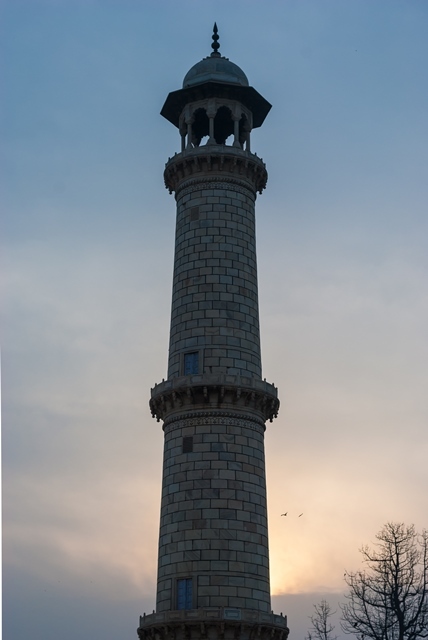 The minarets at each corner lean outward slightly, to counteract the effect of perspective when you look upward. 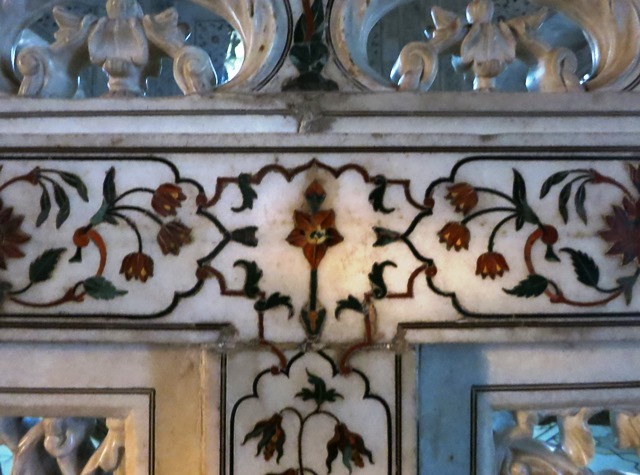 Every available space is covered in the beautifully ornate calligraphy, and precious stones carved into floral motifs which represent paradise, and are ubiquitous in Persian architecture (the building’s chief designer was from Shiraz). 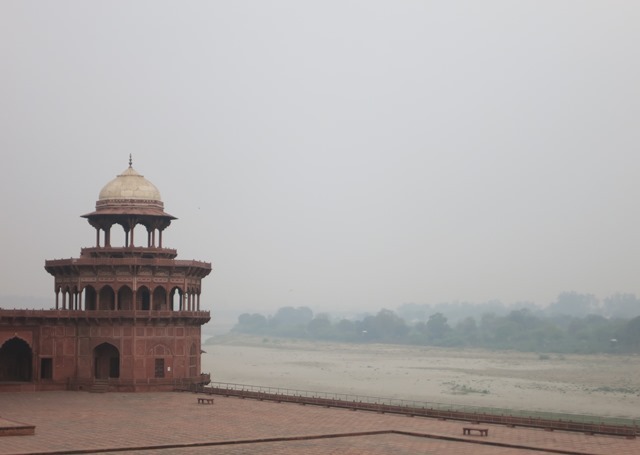 The rising sun had started to peek over the domes of the jawab (see below) on the East side of the complex, giving the mausoleum a warmer, pinkish hue, and the mist had started to roll backwards across the Yamuna river. Sitting on a raised wall facing the main facade for a while taking it all in I still had to agree that yup, it was very nice. I just wasn’t blown away. 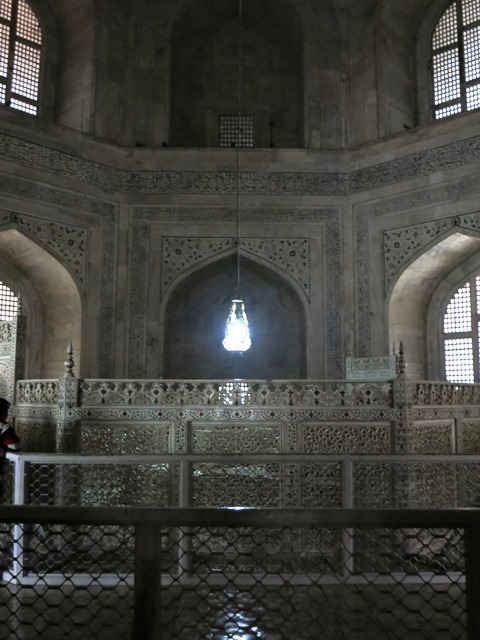 We wandered into the gloom of the inner mausoleum where – despite the sign forbidding photography – flashes from camera phones lit the room like strobe lights. 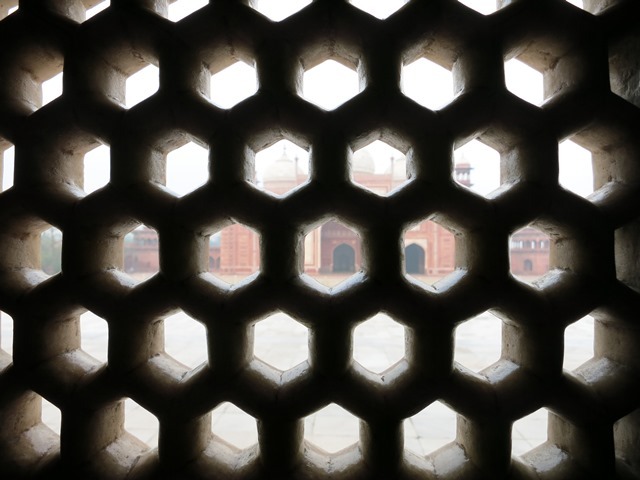 A honeycomb marble filigree allowed light to filter through, and was only slightly marred by the newer addition of an industrial steel grill. 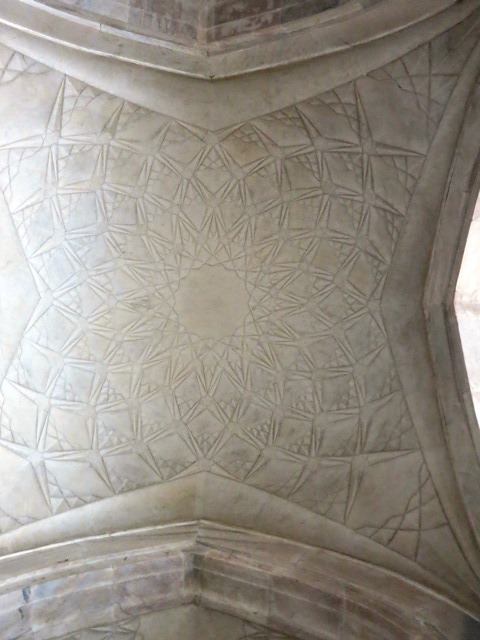 After an obligatory walk ’round the cenotaph, I wandered off to a side room to photograph some interesting geometric patterns highlighting the vaulted ceiling. 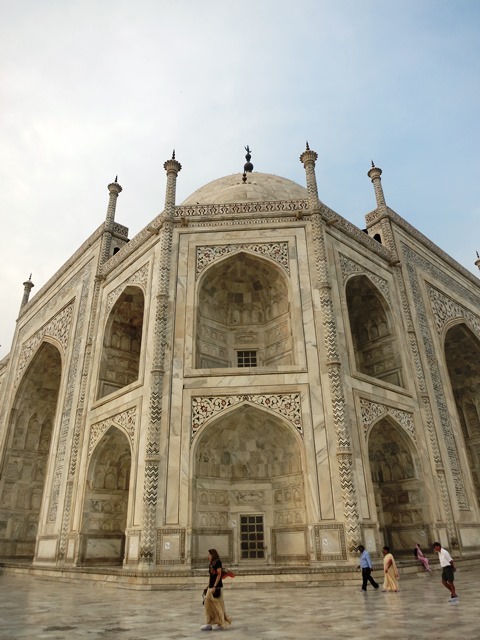 Our journey took us out to the rear of the building which mirrored the front, but the absence of crowds gave us a chance to take in the craftsmanship. For the first time I started to get a sense that there was something special about the place. 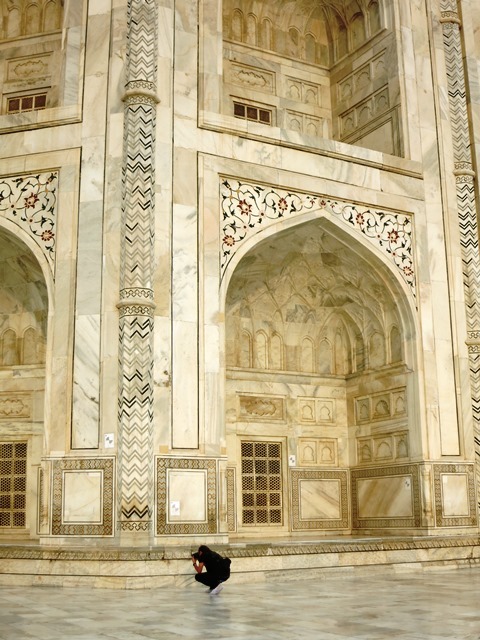 I’ve never been a huge fan of marble as a building material, but the expanse of the Mahal and the intricacy of the carving gave the facades a kind of fluidity that was at odds with the monolithic nature of the stone. Only when you walk right up and touch it does it feel solid, and then you are hit square-on by an overwhelming sense of just how solid it is. 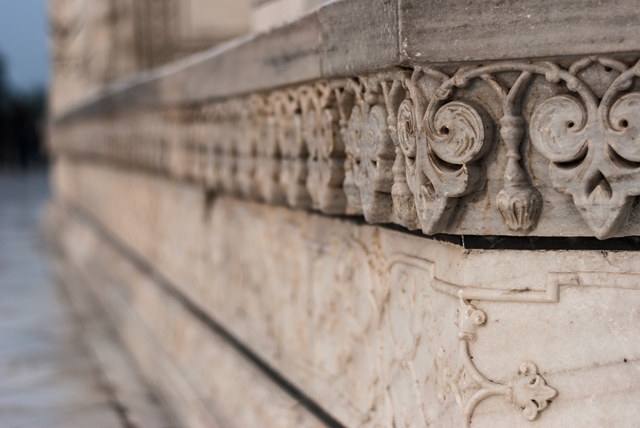 The changing tones in the marble make it seem more like a single, natural phenomenon that has eroded over time. 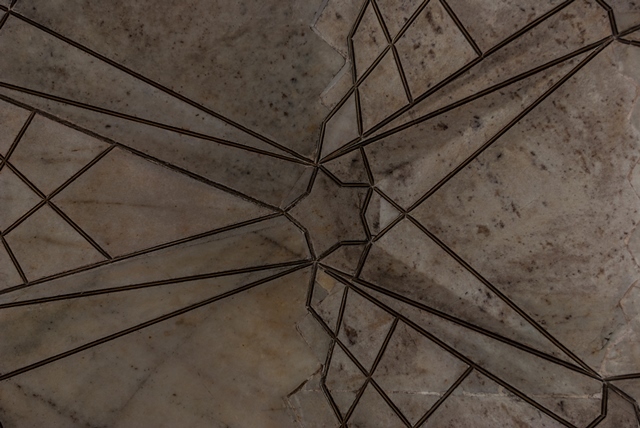 They cause your eye to slide over the surfaces, from the geometric blind arches to serpentine marble hibiscus. We wandered slowly now, taking in more little details. 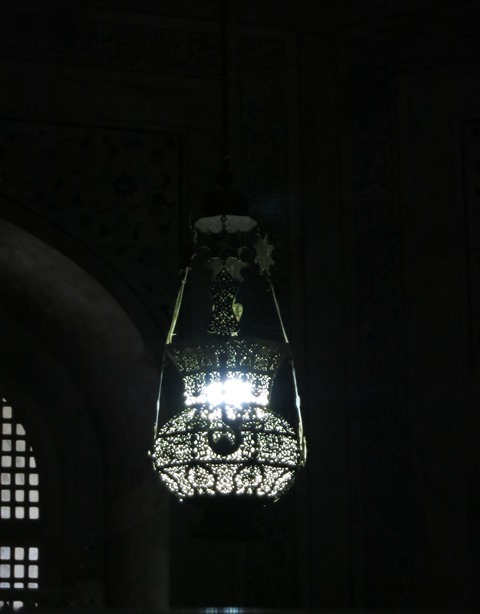 Something had changed; either by going through the mausoleum, or by circling around the building, I’d gone through the ritual that allows you to understand what this place is. 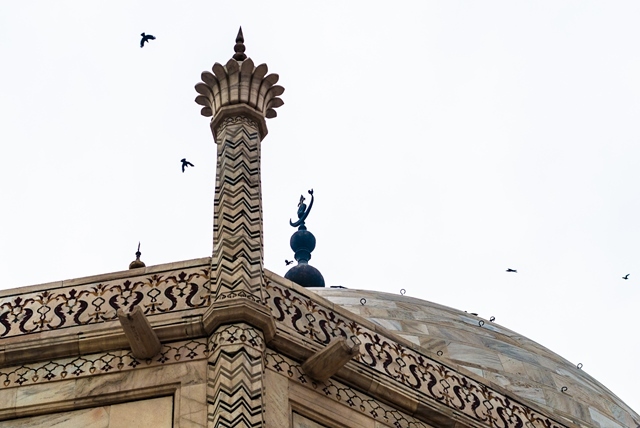 The small spires at each corner of the building are emblazoned with black chevrons that break the milk-like meandering of the marble and shoot upwards, taking your eye with them to the gilded finials on top of the domes. 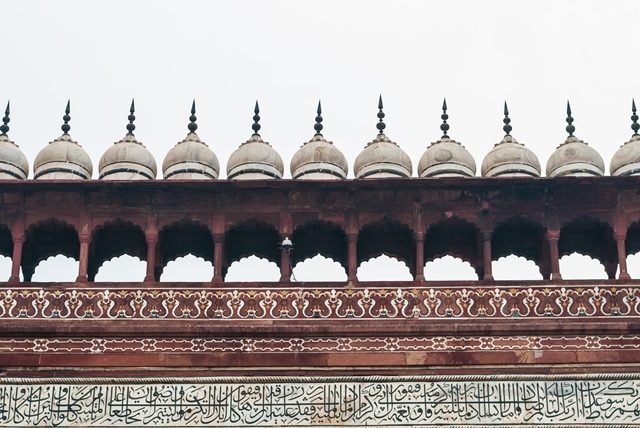 The increasing size of the calligraphy as it stretches away from you towards the top of the iwan doesn’t just achieve it’s purpose of offsetting the effects of perspective, it gives you the feeling you are looking at something…. not quite right. The rules of ordinary life seem slightly skewed, and if you were a believer you could be easily convinced that it was the result of being close to divinity. 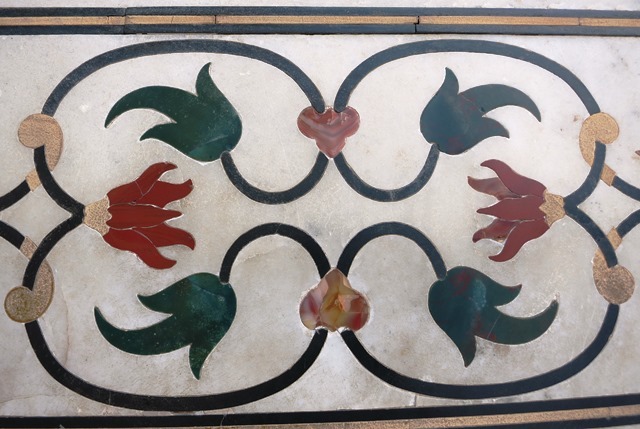 The floral motifs decorating every vaulted arch now seemed like the lingering tendrils of a garden of paradise lying just beyond reach. All that’s missing are the rivers running with milk, honey, and wine. We walked back to our old seat in front of the facade and sat down again. 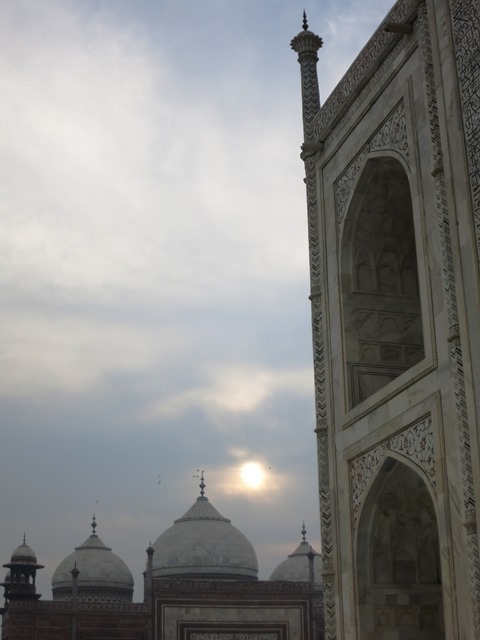 Undeniably now, I could see that the Taj was special. All the little details I’d studied up close still jumped out at me from afar, but the overall impression of the Palace had changed too. I wasn’t looking at the same building I’d seen an hour or so ago. 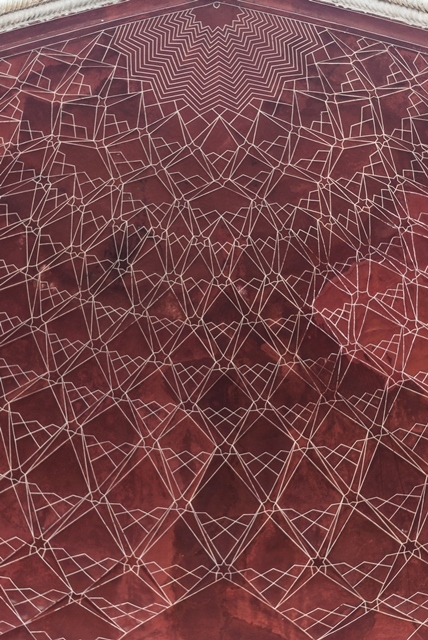 It’s really hard to explain: Every time you lay eyes on a tiny piece of embellishment, you get the sense that without it, the overall design would have been diminished. It’s the whole, and the sum of its parts, and something else intangible. After staring at it for a long time, Maria started to shift uncomfortably. A little later she started mentioning that lunch time was approaching. Eventually she forcibly removed me from my seat. 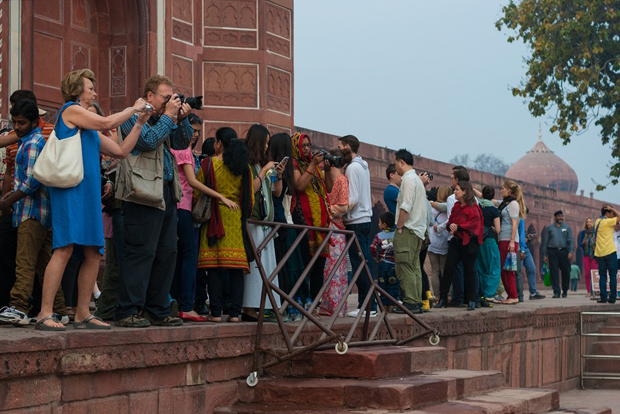 As we were walking back towards the ‘great gate’ I passed another couple. A youngish man was leading his partner (probably another architect) firmly towards the exit. Every so often she’d turn for one more glance. I felt for her, because I saw it too; it’s just that I’m not really sure I could say what it is. (In case all that seems a little high-brow and pretentious:) Apparently, during construction the standard bamboo scaffolding was eschewed in favour of a huge brick version mirroring the temple itself. 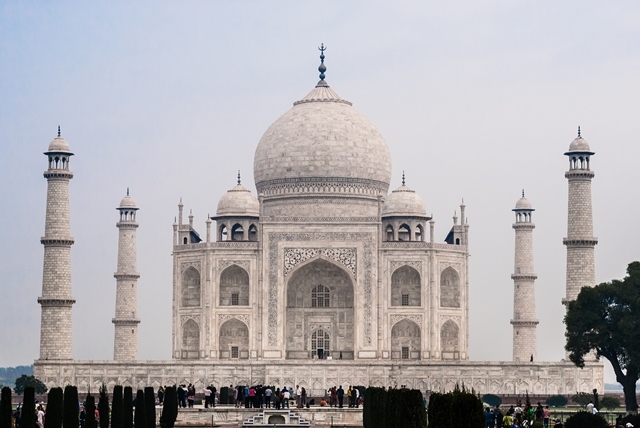 Foremen predicted that it would take several years just to remove it all, so after construction Shah Jahan announced that the bricks were free for anyone who wanted them. The entire scaffold was dismantled by peasants overnight. 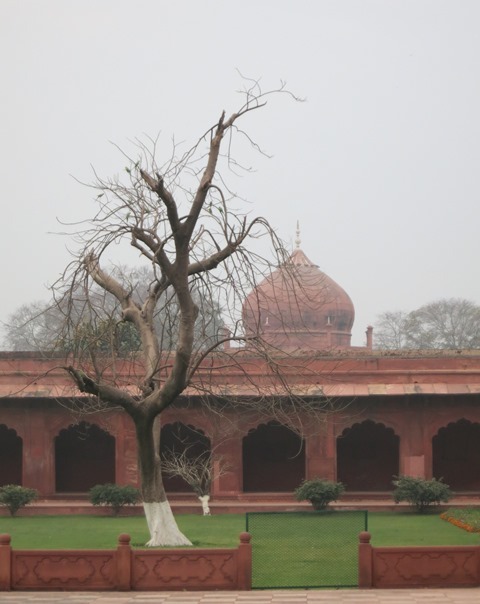 In four hundred years, India hasn’t changed all that much. 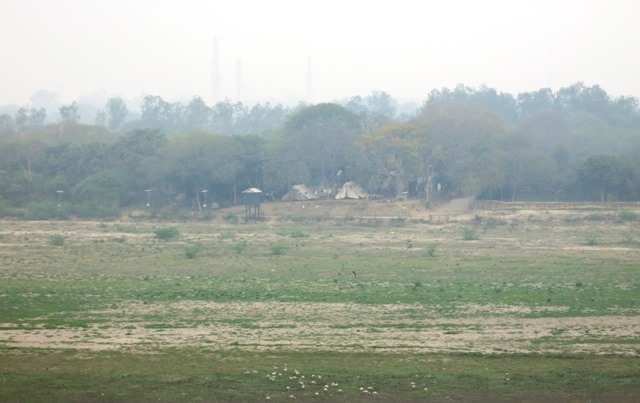 Behind the Taj lies the Yamuna River. 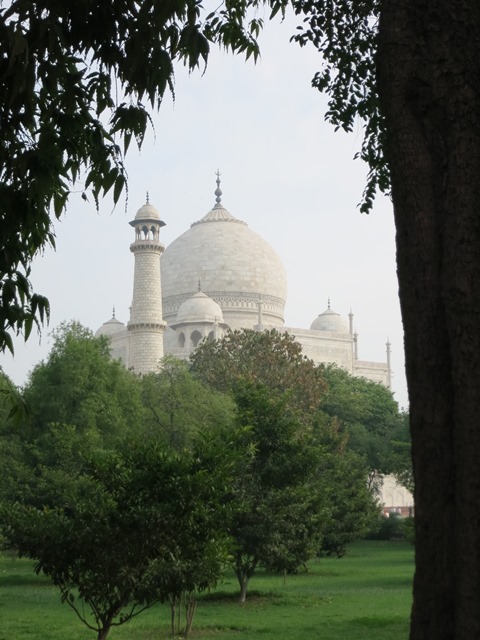 Directly across are some beautifully kept gardens with a stunning view of the Taj. And of course there is a little tent slum right next to it. This is India after all. Stunning beauty and riches and poverty and squalor coexists right next to each other, wherever you look. 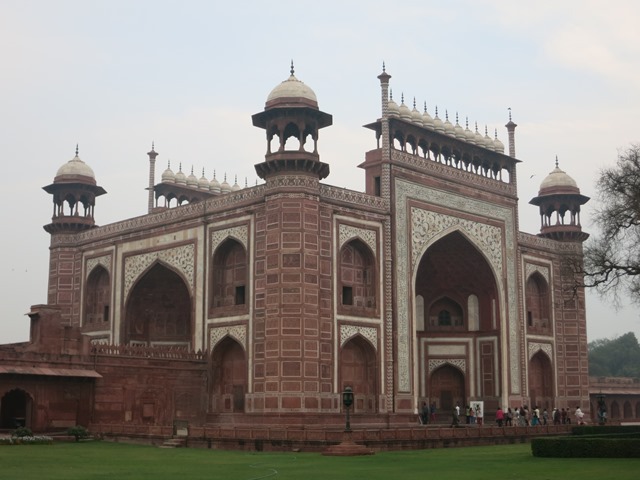 To the west of the Taj Mahal is a red sand stone and marble Mosque with floral and geometric designs mirroring those of the Taj and to the west is an almost identical jawab, balancing the geometric layout of the site. 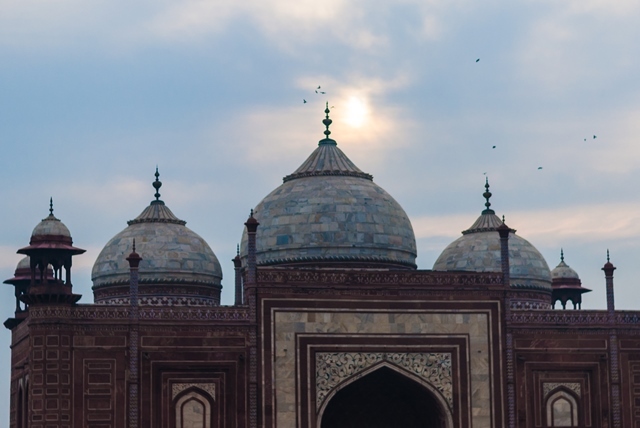 The jawab cannot be called a mosque, as it does not face Mecca. 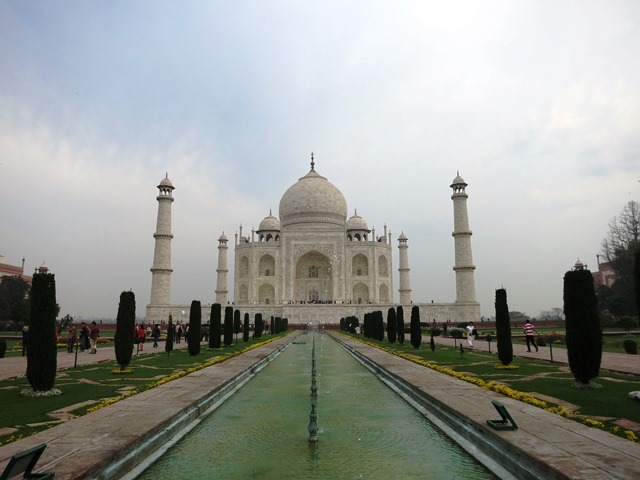 We wandered around these as well, though their beauty paled next to that of the timeless architecture of the Taj Mahal.